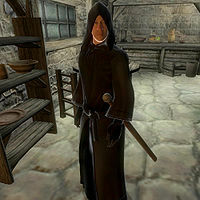 Belisarius Arius is an Imperial assassin, and a speaker of the Dark Brotherhood's Black Hand. He is killed by Mathieu Bellamont at the end of the quest; "Honor Thy Mother." Belisarius will only appear in the game when the player initiates the quest Following a Lead. He always wears the robes of a Black Hand member with a matching hood and doeskin shoes. He carries an unenchanted iron longsword as his only weapon, and a small amount of gold. The life of a Speaker doesn't seem to suit Arius. When you talk to him in Applewatch, he will complain that "Most of my time is now spent on administrative duties. I have not had blood on my hands in far too long! Killing Lachance was pure ecstacy [sic]. ", adding "Sithis is Master! All hail the Dread Father!" instead of a simple "Goodbye". When the Black Hand descend into the Night Mother's crypt during the Honor Thy Mother quest, Arius is removed from the Dark Brotherhood faction and added to the DarkBrotherhoodRitualFaction instead. In the game, it is stated that Belisarius is a Speaker of the Black Hand. However, in the construction set, Belisarius is only listed as a Murderer in the Dark Brotherhood. The information listed in the summary box is the construction set faction, because this is the information that controls the NPC's disposition, dialogues, and responses to scripts; see Factions for details. He may be an ancestor of Leonara Arius, who appears in Skyrim. Esta página foi modificada pela última vez à(s) 16h22min de 2 de maio de 2013.